Was a French Woman, not Gala, the Model in this Dali Masterpiece? 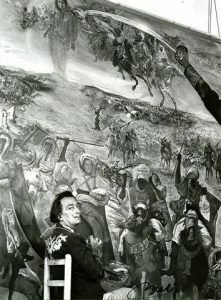 The face of the woman standing in the upper portion of Salvador Dali’s huge 1962 painting, Battle of Tetuan – presumed to be Dali’s wife Gala ever since it was painted 57 years ago – now appears to actually be that of a young former United Nations guide, whose look was the precise “type” for which Dali was searching. At least that’s the view of Marie (nee Weizmann) Briefel, who says she thinks she was the inspiration behind the Virgin who appears ethereally above the battle between Spain and Morocco, surrealistically captured in Dali’s 10-ft. x 13-ft. canvas, which is owned by the Morohashi Museum of Modern Art in Fukushima, Japan. If this is true, Dali scholars and aficionados aren’t the only ones who were in the dark about this all these years. Mrs. Briefel herself wasn’t aware of it until only a few months ago! 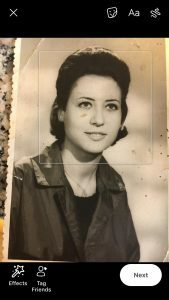 The surreal twist in this esoteric yet fascinating tale began in 1961, when Marie Weizmann – a French young lady whose family originated from Morocco – found herself working at the United Nations in New York City at age 19. 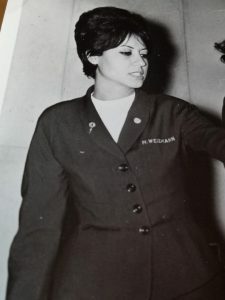 She was a young tour guide there, and was asked to be in charge of visitors such as Yul Brynner and Frank Sinatra, the latter with whom she co-hosted a U.N. Day. One evening, while she happened to be at the St. Regis Hotel – Dali and Gala’s winter home for many years – the artist approached her, coming toward her “like a bull! 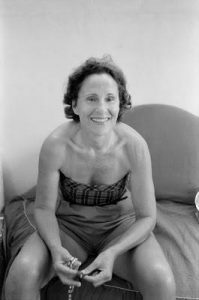 I told him, ‘I know you, but you don’t know me,’” Marie recalls. “It was like he was looking for something and had finally found it!” she says in describing the intensity with which Dali greeted her. Marie later learned Dali went to various New York universities for inspiration, since foreigners would likely be found there and he was looking for distinct facial features. 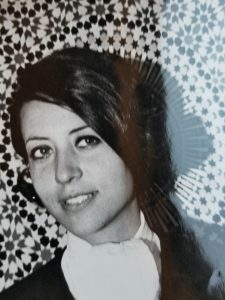 He asked me, ‘Where can I reach you?’ I told him I worked at the United Nations,” Marie said. She was understandably cautious, being a young woman alone in the big city. “I was safe at the U.N.,” she said. “Two days later Dali called me and said, ‘Please come, I need to talk to you.’ He was very firm and made arrangements to meet at the St. Regis. “We sat at a table and I was wearing my uniform. It had my name on it. 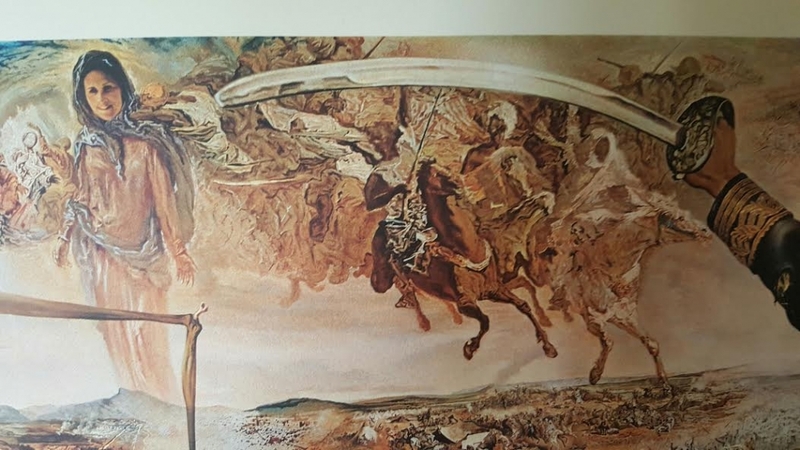 Dali was with a female companion whose identity Marie doesn’t know, but he turned to the woman and said, “You see what I told you!” He was confident that what he was looking for was precisely what Marie represented – and was now seated across the table from him. Dali and his entourage eventually returned to Europe after wintering in New York. Three years later, Marie moved to Paris, France. The issue was essentially dropped and, over the decades, forgotten. That is, until Marie’s daughter, a professor at Bowdoin College in Brunswick, Maine, gave a lecture last November at a conference in Florida. While there, she visited the Salvador Dali Museum in St. Petersburg. 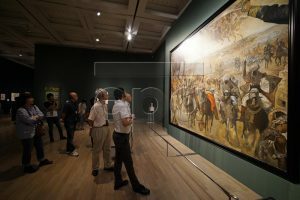 She had remembered her mother telling her the Battle of Tetuan story and decided to google the work. 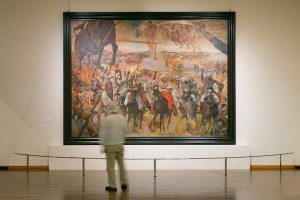 But the connection between Marie Weizmann and Salvador Dali didn’t end when he left for Tetuan that day in 1961. There was another brief encounter four years later in Paris. As coincidence would have it, she was dining one evening at the oldest restaurant in the city – L’Escargot Montorgueil – and Salvador Dali was there. “He stood up and exclaimed, ‘You are here? !’” Marie recounts. Marie, who currently works as a legal recruiter for law firms in New York, points out another interesting “wrinkle,” of sorts, in this unusual turn of events. If you look carefully at the blouse of the female figure in question, Marie believes you’ll discern the letter “W,” which she figures stands for Weizmann. 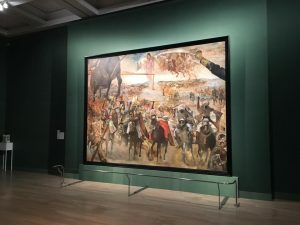 Says Marie: “The painting is like a puzzle, where you put the pieces in place…The painting that I discovered very recently is very interesting and complicated, as must have been the thoughts of Dali. And may Salvador Dali rest in peace, as today marks the 30th anniversary of his passing.